Starting November 1st, I am participating in another challenge similar to the 31 Days Challenge where I wrote the 31 Days of Journaling Prompts everyday of the month. 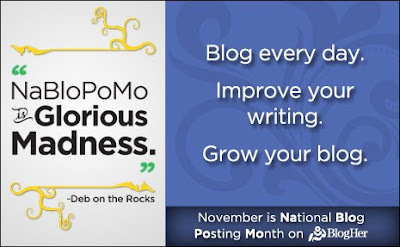 In November, I will be participating in National Blog Posting Month, also known as NaBloPoMo, hosted by BlogHer. Yes, I’m crazy! Why do you ask? At this point, I am not going to make any promises that I will, indeed, write every day for the month of November, but I am certainly going to try. Part of the incentive is some pretty awesome prizes that BlogHer is randomly giving away to those who participate every day, but the true reason is because I have really come to enjoy writing throughout the month of October, and I liked the blogging prompts that BlogHer listed for NaBloPoMo. Oh! 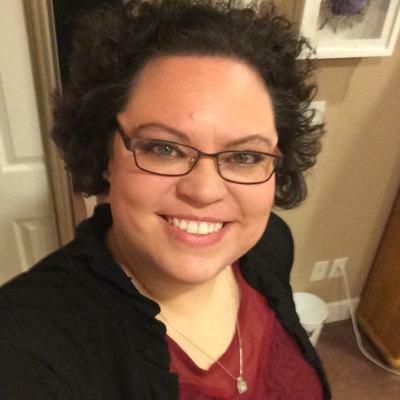 One other reason is that about 7 years ago, I got a wild hair and thought I would participate in NaNoWriMo (National Novel Writing Month) and only made it about a fourth of the way through when I was so lost in what my characters were doing, saying and going that I gave up and never tried again. If the past 31 Days taught me anything, it’s that I am definitely more comfortable writing in my own voice than I am in a fictional voice. So maybe, just MAYBE NaBloPoMo is for me. I guess we’ll find out! On this page, I will post the links to my daily entries. The prompts are subject to change. Weekends are for free-writing, and I will post them as they occur. I am also swapping Fridays and Saturdays and plan to participate in Lisa Jo Baker’s Five Minute Friday. Tell us your favorite quotation and why. What are your thoughts about tomorrow’s election in the United States? If you were President of the United States, what would be your first act in office? Where is your favorite place to blog? Tell us about the best meal you ever cooked. If you had the superpower to know what everyone was thinking (but not saying) would you use it? Would you buy your dream house if the price was right BUT you also were told it was inhabited by ghosts? If you had to get locked in some place (book store, amusement park, etc.) overnight alone, where would you choose to be locked in? Who is someone you wish you could see again? What is the hardest word for you to say? Do you speak more than one language? How did you learn the additional languages? What has been the hardest part about blogging daily? awesome!! They have some really cool and interesting prompts. I wish I could participate…but I always have some plan going it seems. I have to finish up the series on Change I started, and the Christmas shopping deals thing, etc. I am going to write on a few of these though. 🙂 Looking forward to the things you will come up with.. I found Sunday Scribblings for prompts on Sundays (similar to Five Mnute Friday where it’s just one word). I plan to participate in those on Sundays, so I should have my month mapped out now.